Over the past year Ive worked to acquaint our readership with recording companies that regularly create audiophile-quality recordings. It seems to me that such ventures should be household names to SoundStage! Network readers. So far Ive made the case for 2L, Linn, Stockfisch, and Blue Coast as audiophile labels. These companies make recordings of such high caliber that we should pay attention to anything they release next. This month, lets add MDG, a German company that achieves excellence with both two-channel and especially multichannel recordings. MGD stands for Musikproduktion Dabringhaus und Grimm. Its chief player is Werner Dabringhaus, who acts as recording producer, engineer, and CEO. Dabringhaus seeks out artists and recording locations that have generally gone unnoticed by less adventurous and perceptive recording engineers. Yes, he records Haydn and Brahms, but for every well known work he produces theres a disc of mostly unknown music thats always a wonderful discovery. He has recorded many of the titles in his catalog in multichannel sound, initially putting them on DVD-Audio discs but switching over to SACD as it became the preferred multichannel medium. Hes developed a new system for surround that he calls 2+2+2, wherein there are two front speakers, two speakers in the rear, and two smaller speakers placed above and behind the front speakers. This last pair replaces signals from the center and LFE channels, giving a sense of height and depth for a real location feeling. Its never caught on in the U.S., so its a good thing that the system proves compatible with the more familiar 5.1. Its a tall order, but its one that every MDG recording Ive ever heard (and Ive heard most of them) delivers. Here are capsules of some of the most recent titles, hybrid discs that can be heard in both multichannel and stereo sound. I listened to them in multichannel, but I can assure you that the stereo tracks are also superb. Norbert Glanzberg (1910-2001) was born in what is now Ukraine, but he grew up in Germany, where, as a young man, he made quite an impression on the famous composer Richard Strauss by playing his score for the opera Intermezzo from memory during a power outage. Glanzberg wanted to conduct, but he ended up composing film music, most importantly for the films of revered director Max Ophüls. He became acquainted with Edith Piaf and wrote some of her most memorable songs, but after everyone hed been associated with passed away, he was left alone with lots of time, which allowed him to pursue classical composition. 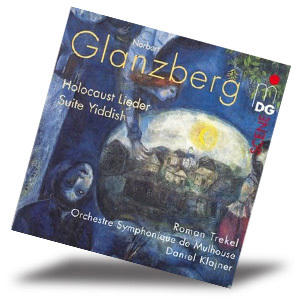 The two works on this disc, then, are from the last two decades of Glanzbergs life. They werent originally for orchestra, but theyve been expertly arranged by Daniel Klajner (Holocaust Lieder) and Frederic Chassen (Suite Yiddish). The composer didnt change his style toward the end of his life, so these pieces are colorful, romantic, and listenable excursions. As the producer, Dabringhaus has gone just over the border to France to record this music with the excellent Mulhouse Symphony Orchestra, under the baton of its music director, Daniel Klajner, and with veteran singer Roman Trekel as the sensitive, sonorous soloist. Klajner creates a perfect balance between Trekel and the orchestra, and Dabringhaus accurately captures it with no additional knob twiddling. Its an extremely natural-sounding recording, offering great transparency with no sacrifice of warmth. 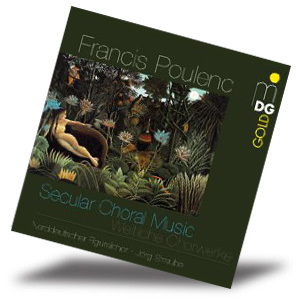 French composer Francis Poulenc (1899-1963) left a large number of works for chorus, some accompanied by orchestra and others for chorus without accompaniment. Of the latter, he composed music to both religious and secular texts. This disc conveniently offers these works with music written between 1922 and 1945. Poulenc had an uncanny knack for conjuring choral tone pictures without resorting to the use of instrumental colors. The Un soir de neige, for instance, sounds "cold" from the composers use of open harmonies, fourths, and fifths, as it occasionally zaps your ear like the winter wind with more involved harmony. The excellent medium-sized chorus, which Jörg Straube formed in 1981, sounds like a real entity, its members breathing and enunciating together at times as one person. The intonation is perfect, and the overall sound is rich and warm. The chorus also sounds good in the recording, which is very natural and revealing. A careful choice of microphones has allowed a choral recording without the sibilant hiss that can often mar such efforts. Piquant, appealing music; impeccable performances; and ideal recorded sound make this one a sure keeper. 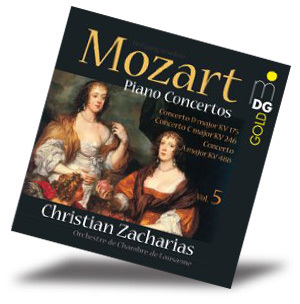 Dabringhaus and his label enter fairly familiar territory here in their fifth volume of Mozart piano concertos. The performances are fleet, elegant, and lyrical. Theres no resisting the virtuosity and charm that pervade the "Allegro Aperto" of the eighth concerto, which opens the disc. This movement draws you into a world where all the musicians play as one. The interplay between piano and winds is impeccably dovetailed; in fact theres simply not a false move from anyone at any time. The multichannel recorded sound puts the piano just slightly in front of the strings with the woodwinds and brass in the rear. The placement is so exact that you can close your eyes and virtually see the setup of the piano and the 44-piece orchestra. After experiencing the quality of recording on this disc, youll be happy its the fifth volume. That means there are four previous jewels to explore, and the hope that there will be more to follow. Can it be? The music of Arnold Schönberg has been around for so long now that his once innovative 12-tone system of composition actually sounds old fashioned. Not dated, I should add, but old-fashioned in a good sense. The Five Pieces for Orchestra (5 Orchesterstücke) was his first large-scale effort to incorporate his new compositional techniques into a work for larger forces. In it, he explores the many tonal colors of the orchestra, and though the scoring is for full orchestra, the music is so cleanly written that it often sounds like chamber music. He wrote the five songs earlier, and you can sense in them an admiration for Gustav Mahlers music. 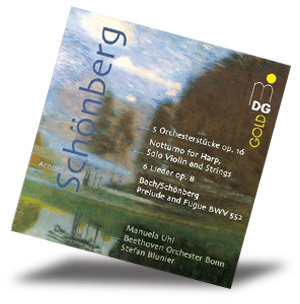 The transcription of one of Bachs better-known prelude and fugues was one of three in which Schoenberg tried to improve on Bachs original, feeling the organ, for which the pieces were originally composed, had its limitations. The splendid Bonn orchestra plays all the music with precision and warmth, and soprano Manuel Uhl proves a perfect choice as soloist in the songs. The recording is not so close up, which is fine by me, since it manages to achieve a mid-hall vantage point without sacrificing any presence. The dynamic range of the music is demanding, but the recording meets it head on. Youll want to do a little experimenting in setting the level on this one, and pick a time to listen when none of your creature-comfort machines (refrigerator, air conditioning, etc.) are running so you can have dead silence. Then youll hear what I consider a perfect recording of its type, one that reminded me of the glory days of the warm yet lucid sound of Capitol FDS in the golden days of stereo. Of course Dabringhaus has done that one better by using surround and his 2+2+2 setup. Dont miss this one.